Lily James | No Chic. Just Geek. It was Friday night, and the lights were low (as you would expect, in a cinema). There were people everywhere – a sense of expectation hanging in the air. My impatience was slowly creeping up my spine and growing strong. Sitting there no-one could harm me. They just stared at me and wondered why. As regular readers will be able to confirm, I can keep this sort of thing up indefinitely, but I expect you are more interested in hearing about Ol Parker’s Mamma Mia! Here We Go Again than in clumsily repurposed pop song lyrics, so let’s crack on with that. As it seems like the UK is currently experiencing a shortage of everything except shortages, cinema tickets are not quite big enough to accommodate that title in full, and so the ones we ended up with were apparently for a film entitled Mamma Mia! 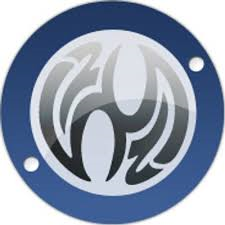 HWGA. By a strange coincidence, when I asked Next Desk Colleague if he wanted to come and see the film, his response actually was ‘Hwga!’, or at least a very similar sound. The same was true of nearly all my male co-workers when I broached the possibility with them – although there was one guy whose response of ‘I have a serious issue with the intrinsically non-diegetic nature of the musical as a cinematic form’ rather impressed me. Nearly all the distaff members of the office hurled themselves at the chance, though. Mamma Mia! 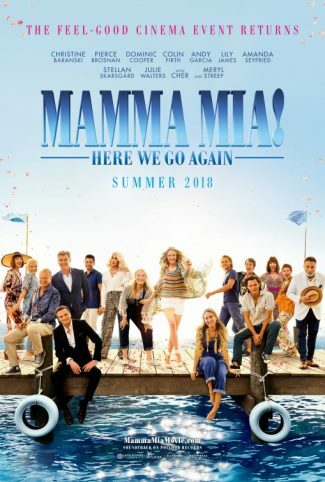 Here We Go Again, in case you have recently arrived from Neptune, is a sequel to 2008’s Mamma Mia!, an alarmingly successful contraption based around creatively-cast performers doing unorthodox cover versions of songs by Abba, one of the greatest pop groups in the history of the planet. This recipe ended up making $615 million, somehow, and so inevitably a sequel has arrived. The first thing we should say is – now, does this constitute a spoiler? It’s a plot point that’s introduced virtually at the start, so I’d usually say no, but at the same time it’s deliberately obfuscated in the trailer, so… Oh, what the hell (spoiler alert). So – some time has passed since the first film, and central figure Donna (Meryl Streep) has carked it in the meantime, though whether this was a creative decision or just the result of Streep not really wanting to do the movie I’m not sure; suffice to say that despite her prominence in the publicity, her actual involvement is minimal. This opens up the film to employ a structure which will probably be familiar to fans of The Godfather Part 2, although quite how big the crossover audience between The Godfather and Mamma Mia! is I’m not sure. 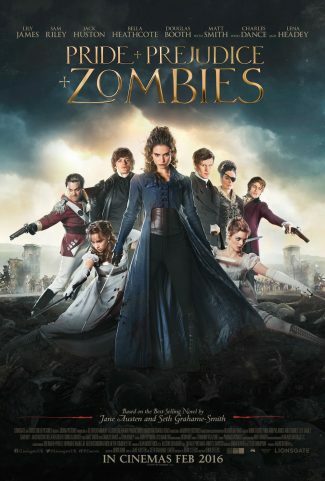 Basically, we have one storyline which is a prequel to the original film, in which a young Donna (Lily James, whose publicity material will probably now contain the words ‘has been compared to Meryl Streep’ in perpetuity) leaves Oxford University, goes travelling in Europe, and embarks on the regimen of random promiscuity which will eventually leave her a single parent in charge of a rather cruddy Greek hotel. The other plot strand concerns Donna’s daughter Sophie (Amanda Seyfried), who is struggling to reopen the same hotel thirty years later, with the help of her mother’s friends and widower (Pierce Brosnan). It soon becomes clear that Brosnan is basically being kept locked in a shed, well away from any sheet music, in case he attempts to sing again. (We will return to this.) Also helping out is a new character played by Andy Garcia, named Fernando (which if you ask me is tantamount to cheating). Will the reopening of the hotel be a big success? Will Sophie’s other two possible-fathers (Stellan Skarsgard and Colin Firth) make it to the island in time? Will anyone get the chance to sing ‘King Kong Song’? I am tempted to say that if you’re the kind of person who found The Greatest Showman just a bit too gritty and hard-hitting, Mamma Mia! Here We Go Again will probably be right up your alley, filled as it is with appealing young actors, some of the broadest comedy turns imaginable, and – of course – a selection of indestructibly great pop classics. That said, of course, I suspected this film might face what I call the More Abba Gold problem. Permit me to explain – Abba Gold is pretty much an essential album for anyone interested in pop music, being literally all killer, no filler: perfect hooks and choruses, emotional resonance, immaculate production, and so on. Every song on it is deservedly famous. More Abba Gold? Not so much. I mean, it’s still got songs like ‘Honey Honey’ and ‘Summer Night City’ on it, which are quite well known, but also things like ‘Cassandra’ and ‘So Long’ which I doubt I’ve ever heard. The question is this: are there enough first-rank Abba songs left to fill up another two hour movie? Still, even an obscure Abba song is most likely a masterpiece of composition and production, and overall the music passes muster. But I have to say that much of the charm, if that’s the right word, of the original film is that it’s basically about a bunch of randy middle-aged people on an island together launching unprovoked assaults on the highlights of the Abba back catalogue. The focus here is much more on randy young people, and despite winning performances from many of the cast (and I have to say that if Josh Dylan, who plays the young Skarsgard, ever visits my workplace he will be beating women off with a stick, based on the reactions of my colleagues), it is somehow less mesmerically weird and exciting and funny than the original film. We’re practically into the home straight by the time all the original characters reconvene on the island, and I have to say I can’t help feeling some of them are a little underserved. I didn’t go to Mamma Mia! Here We Go Again to listen to Lily James singing; I went there to listen to Pierce Brosnan not singing (and to watch Colin Firth not dancing, for that matter). Brosnan is permitted a brief reprise of his legendary version of ‘S.O.S’ but is otherwise restricted to doing choruses alongside other people, which if you ask me is just not fair. Still, everyone was singing along with the choruses during the film, and we all emerged with big smiles upon our faces, so I suppose Mamma Mia! Here We Go Again really does the job as a piece of entertainment. It isn’t as riotously silly as the first film, but it’s still a case of a deeply spurious non-plot being deployed to facilitate as many wonderful tunes as they can possibly get away with, topped off with a lot of knockabout humour and even a few quite touching emotional moments. I expect it will end up doing very well for itself. It’s simple and it’s plain – why should I complain? 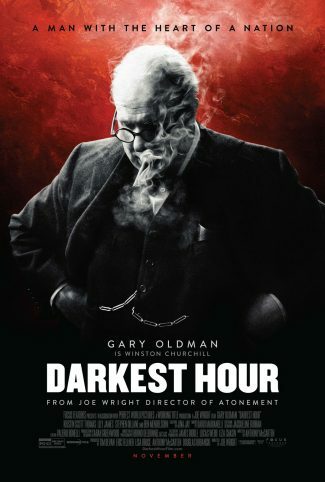 Another week, another film about the Second World War – on this occasion it is Joe Wright’s Darkest Hour, a based-on-fact drama about the first days of Winston Churchill as the British Prime Minister in 1940 (not to be confused with the bobbins Timur Bekmambetov alien invasion movie of the same name from a few years back). We seem to be in the midst of a bunch of these at the moment – last year, after all, there was Christopher Nolan’s Dunkirk, which concerned itself with almost exactly the same period of history, and a film about Winston Churchill directed by Jonathon Teplitzky, starring Brian Cox as Churchill himself, the name of which momentarily escapes me. Is there a particular reason for this particular spate of films on the same subject? Well, maybe: we shall come to that, probably. I would imagine (or hope) that the events covered by Darkest Hour are already known to most people, in the UK at least. It is May 1940, and the position of the British Prime Minister Neville Chamberlain (Ronald Pickup) has become untenable following his role in attempting to appease Hitler the previous year. The obvious candidate to succeed him, Lord Halifax (Stephen Dillane), is unacceptable to the Labour Party, who will be a part of the new government; the only man for them is Winston Churchill (Gary Oldman), widely considered a self-serving maverick whose main loyalty is to himself. Given the situation, and with the United States unwilling to involve itself in a European war, the wise old heads of the war cabinet are in no doubt as to what the situation requires: a negotiated peace, responding to the peace overtures which Hitler’s Italian allies are already making. To do otherwise would be to expose Britain to the most terrible danger. If Churchill refuses to listen, then he has to be removed from office and replaced by someone more pragmatic. Faced with opposition both at home and abroad, is he really justified in sticking to his principles? There are, obviously, many things one can say about the less palatable aspects of Winston Churchill, and his many utterances which would (hopefully) be career-ending nowadays. This is a man who at various points in his life was a racist, a keen advocate of the use of chemical weapons and also a cheerleader for eugenics. Yet this is also a figure who seems to transcend easy categorisation: unreconstructed old brute he may have been, but his is the example that seems to prove that one man can shape the course of history – as the popular legend has it, it was Churchill alone who kept Britain defiant and fighting, standing alone against the Nazi tyranny, almost as an act of will. The notion of plucky little Britain going it alone against the rest of the world has become somewhat more loaded in the last eighteen months of so, and I wonder if this isn’t to some degree responsible for the recent surge in movies about the British bulldog spirit (and so on). Personally I think these are dangerous parallels to draw, but everyone in this particular area is in the process of mythmaking no matter what they happen to believe, so I suppose it is inescapable. Certainly, Darkest Hour sticks close to the popular legend for most of its length – Churchill can be a bit inappropriate at times, but is generally lovably so, and is (of course) purveyor of a nice line in scathing wit, and possessor of a mighty oratorical talent. No real surprises there, then. What’s slightly more unexpected is Churchill’s resemblance to a famous actor-director from New Cross. Three and a half hours in make-up every morning leaves Gary Oldman looking astonishingly like Gary Oldman under heavy prosthetics, and the fact he honestly doesn’t look very much like Churchill is a bit distracting. He is on full throttle here, though, and while his turn seemed to me to be somewhat awkwardly pitched between an acting performance and an act of impersonation, he certainly keeps the film very watchable, which is just as well: he’s in the vast majority of scenes. He’s particularly good when it comes to the aspects of Churchill we’re less used to seeing – the film often focuses on his vulnerability, his self-doubt, and his occasional bouts of depression. Not that the support isn’t good too: apart from Pickup and Dillane, Kristin Scott Thomas plays Lady Churchill and is pretty good in what isn’t a terribly big part, and Lily James plays Churchill’s secretary – it does rather seem that James’ part owes its prominence to the need to have a major character who is both female and under forty, if only for the sake of the poster. And for the most part the film tells the story rather well, working as both a wartime drama and a political thriller. It’s not quite so well told that you completely forget how it’s all going to turn out, but it does summon up the desperate atmosphere of the time very effectively, not to mention the various pressures on Churchill. The real question, of course, is that of why Churchill was so implacable in his will to keep Britain fighting the Nazis when victory seemed impossible and a negotiated peace of some kind was a distinct possibility. Where did he find his conviction and resolve? Why did he hold this particular belief with quite such strength? This is the reason why we remember him as a national hero and key figure in British history, after all. And, to be honest, Darkest Hour fluffs this most crucial issue. It does offer an explanation, but it’s one that reeks of the Hollywood script unit and doesn’t remotely ring true to history. Its proposition – that Churchill was simply embodying the will of the British people – feels rather too smug and convenient, to say nothing of the fact that the very phrase ‘the will of the people’ has become rather loaded and subject to misuse of late. In the end, this is the problem with Darkest Hour: the film is well-directed and well staged, although some may find it a little dry and stagey (most of the action consists of middle-aged men arguing in cramped rooms), but it is ultimately telling a story that most people will already be at least partly familiar with. We all know what happened and when, but the real question is why events took the turn that they did. The film does not have a convincing answer to this question. I mean, it’s not what you’d call a bad film, and the performances are very good – it is the kind of film that wins awards, simply because of the subject matter, and you can see why Oldman would take it on – you’re infinitely more likely to win an Oscar playing Churchill than you are Commissioner Gordon, after all. But it doesn’t have anything new to bring to its material, and doesn’t offer any real psychological insights into its subject. Worth seeing, if you like this sort of thing, but unlikely to go down in history as a classic by any means. Interested parties could be excused concern when it comes to the directorial career of Edgar Wright – over the last few years, anyway. Following the successful one-two of Shaun of the Dead and Hot Fuzz, with their associated popular and critical success, a promising career in big-budget movies beckoned – until 2010’s Scott Pilgrim Vs The World proved to be just too idiosyncratic a vision to find an audience, and he was notoriously booted from Ant-Man (a film he’d been working on for the best part of a decade), again because Marvel couldn’t quite get on board with his approach to the material. Wright’s only significant success since Hot Fuzz has been The World’s End – which harsh critics might say suggests he can’t make a good movie without Simon Pegg and Nick Frost. 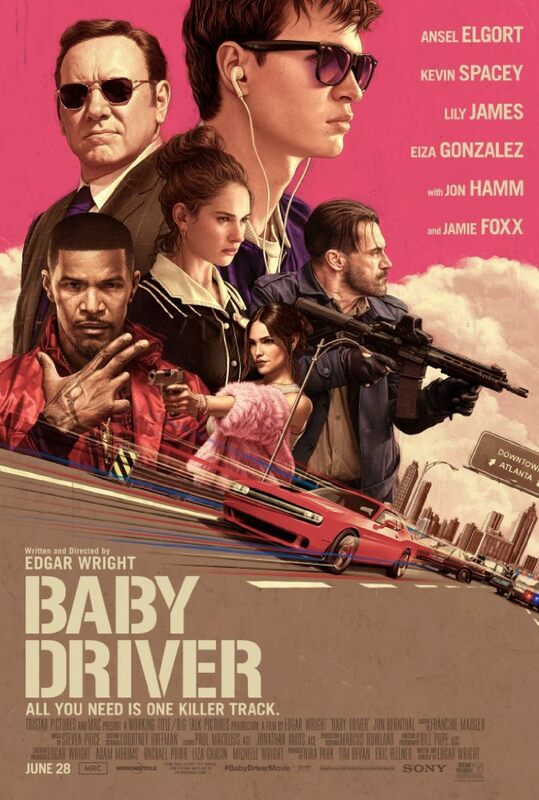 Nevertheless, Wright’s long-time backers at Working Title have stuck by him, and here they are putting their name to another very un-Working Title-like movie – neither a rom-com nor a film with especially serious aspirations, Wright’s Baby Driver is in many ways a modern take on both the kind of stylised urban drama made by Walter Hill in the seventies, and the teen-oriented drive-in tales of a generation earlier. Doc, however, has other ideas, and sees no reason to dispense with Baby’s services – his concession is that Baby will receive his share of the loot in return for his participation now, and if he refuses it will be so much the worse for him, his girlfriend, and his elderly adoptive father (CJ Jones). And so he reluctantly shows up to participate in planning sessions for a raid on a post office, other members of the team including a stockbroker turned robber (Jon Hamm) and a violent psychopath (Jamie Foxx). Baby finds his capacity to ignore the violence and cruelty that’s an essential part of armed robbery is reaching its limit, but how is he going to extricate himself from the dangerous world he’s so deeply involved in? On paper it sounds like a fairly generic crime thriller, with many elements we have seen numerous times before (you may detect faint echoes of the 2011 movie named Drive, as well as The Driver from 1978). What makes Baby Driver distinctive, however, is its soundtrack, which is very prominent throughout the film, and the way the music is integrated into the story: Wright’s inventiveness when it comes to this sort of thing has been clear ever since the ‘Don’t stop me now’ sequence in Shaun of the Dead. I’ve seen it suggested that this is essentially a jukebox musical (although none of the characters actually do any singing), which couldn’t function without the songs on the soundtrack. Well, maybe. In a few places the way the songs are woven into the movie is brilliantly handled – a gun battle where the shots are choreographed to match the drums of the song playing over it, for example – but much of the time Wright doesn’t appear to be doing much more than just sticking a cool tune on over a scene. Maybe the director is a little twitchy about making the film too surreal and stylised, after what happened with Scott Pilgrim, in which case this is kind of understandable. In any case, it is naturally a very good soundtrack; anything which brings artists like Marc Bolan and The Damned to a wider audience will get the nod from me. So in the end, instead of something particularly adventurous stylistically, we are left with that, let’s be generous, archetypal crime thriller, which on the whole is handled fairly seriously. (Although there are some very good gags along the way.) Ansel Elgort is not really required to do much more than look soulful and conflicted, and Lily James is honestly not very much more than a symbol, but they are perfectly fine in these roles. Most of the heavy lifting, in terms of actual acting, is done by the more senior members of the cast, and these performances are possibly the best thing about the movie. Kevin Spacey, Jon Hamm, and Jamie Foxx are all extremely good as characters which frequently turn out to have a bit more depth than you might honestly have expected – the result is a nicely twisty-turny caper, although a few of the final character beats and reversals don’t ring entirely true. In any case it’s nice to find so much heft in a movie that promised to be much more about style and directorial whistles and bells. Those are still here to some extent, and perhaps this is why the various chases don’t give the breathless hit of adrenaline that a really classic movie car chase provides , and why the romance between Baby and Debora feels a bit anaemic and lacking in real heat – an ostentatious reminder of Wright’s directorial presence is never very far away, which stopped me, at least, from completely engaging with the film as a piece of fiction. Still, this is well put together stuff, even if I’m not sure the target audience will recognise all the narrative riffs that Wright is looking to play – rather unexpectedly, he takes the morality of the film and his characters rather more seriously than is fashionable than in a lot of films aimed at this sort of demographic, and it will be interesting to see how that plays with the target audience. Baby Driver is unlikely to transform anyone’s world, but it is a solidly assembled and consistently entertaining film. Whether (and how much) Wright is forcibly restraining his natural instincts in order to make a commercially more viable film is a question I suspect we’ll never know the answer to, but this deserves to do well for him.